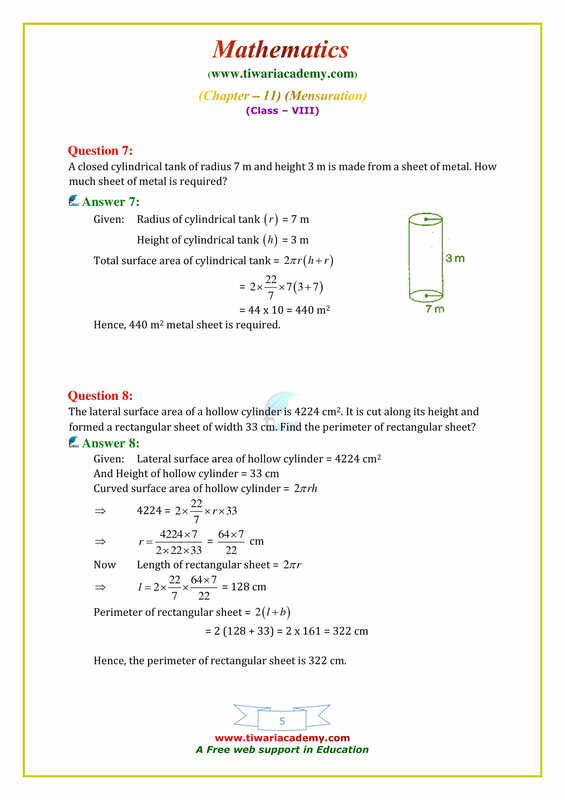 NCERT Solutions for Class 8 Maths Chapter 11 Exercise 11.3 Mensuration in English Medium and Hindi Medium describe each and every question properly. 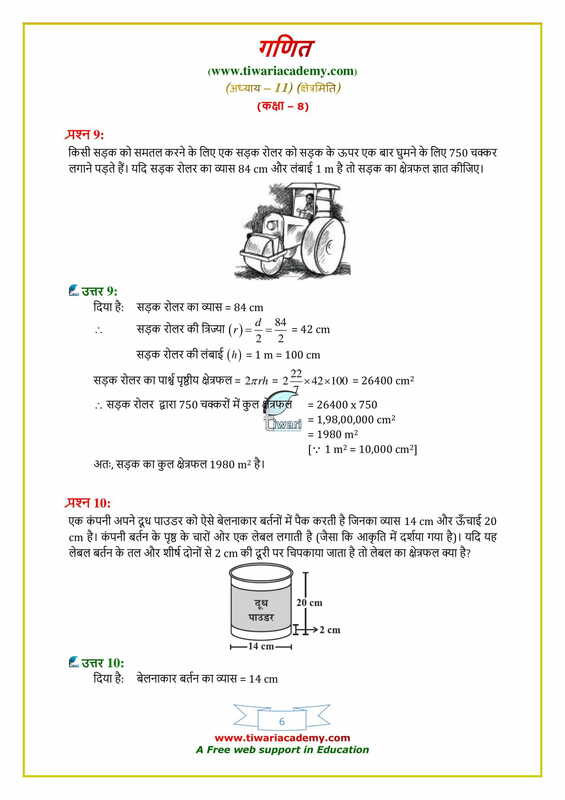 If till there is any problem, please inform us, we will try to solve it. A cube of side 5 cm is painted on all its faces. If it is sliced into 1 cubic centimetre cubes, how many 1 cubic centimetre cubes will have exactly one of their faces painted? The surface area of a cube formed by cutting a cuboid of dimensions 2 × 1 × 1 in 2 equal parts is 2 sq. units. A boy is cycling such that the wheels of the cycle are making 140 revolutions per hour. 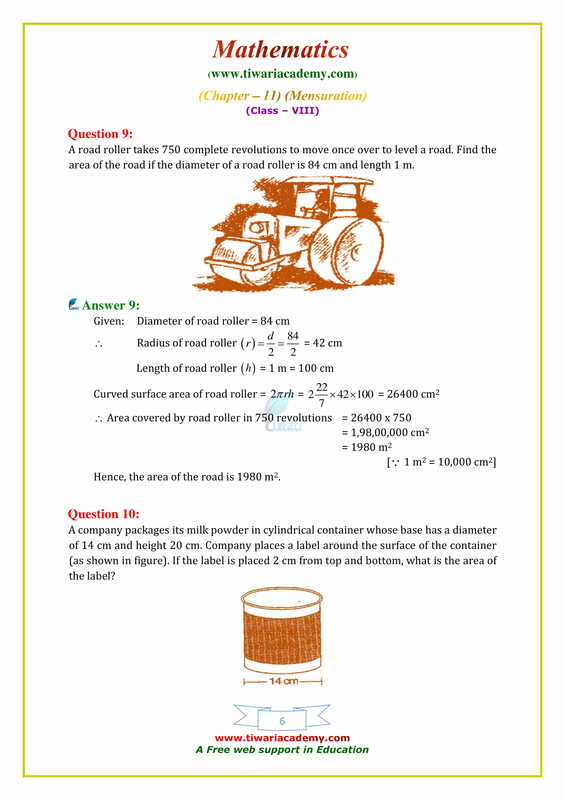 If the diameter of the wheel is 60 cm, calculate the speed in km/h with which the boy is cycling. 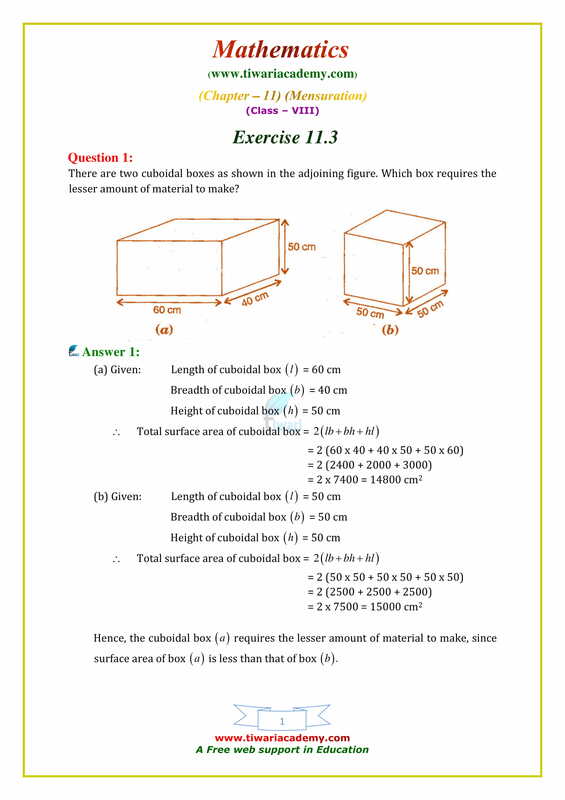 The dimensions of a godown are 40 m, 25 m and 10 m. If it is filled with cuboidal boxes each of dimensions 2 m × 1.25 m × 1 m, then find the number of boxes in the godown. Mukesh walks around a circular track of radius 14 m with a speed of 4 km/hr. If he takes 20 rounds of the track, for how long does he walk? A cube of side 3 cm painted on all its faces, when sliced into 1 cubic centimetre cubes, will have exactly 1 cube with none of its faces painted. A carpenter makes a box which has a volume of 13,400 cm³. The base has an area of 670 cm². 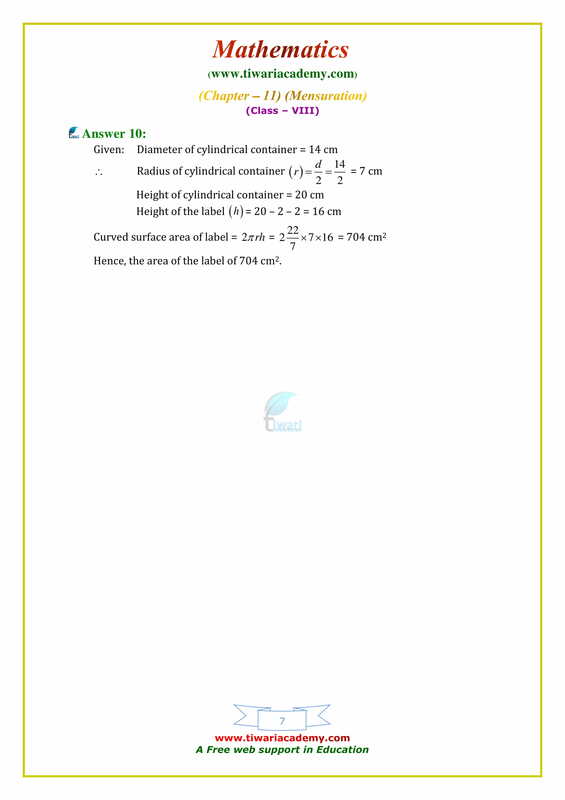 What is the height of the box? A cube of side 4 cm is cut into 1 cm cubes. 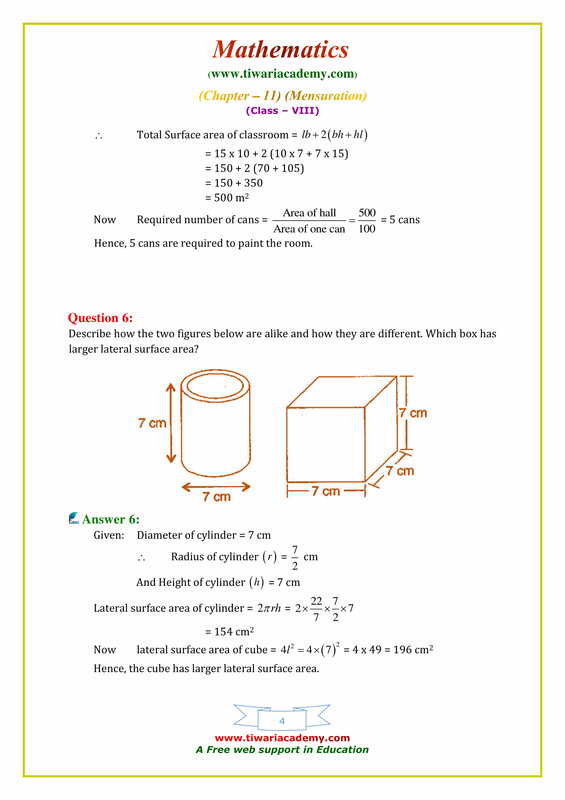 What is the ratio of the surface areas of the original cubes and cut-out cubes? How many cubic metres of earth must be dug to construct a well 7 m deep and of diameter 2.8 m? Four horses are tethered with equal ropes at 4 corners of a square field of side 70 metres so that they just can reach one another. Find the area left ungrazed by the horses.